Student Living encompasses the Middle and High School dormitories, the residential guidance program, evening classes and a recreation program for Middle and High School students. Each program is student-oriented, and services are designed to meet student needs. Student services offered through the residential guidance program include individual counseling, support group counseling, substance abuse education and prevention, and therapeutic services. Counseling services are available for students during the academic day, after school, and during evening hours. 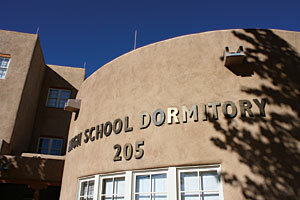 All dormitory students have unique opportunities to participate in structured evening program classes that provide workshops, such as traditional embroidery, beadwork, fly-tying and fishing, country western dance, arts and crafts, Native cooking and traditional agriculture. The Student Living Program also helps to coordinate the Evening Study Hall Program, which includes mandatory study hall for all dorm students. Student Living Advisors (SLAs) are paraprofessional dorm staff that provide caseload services including academic support, off-campus recreation and dormitory activities. SLAs are class sponsors, and they assist in a variety of activities throughout the school year, including the Junior/Senior Prom, school dances, fundraising projects and promotion/graduation preparations. Middle School SLAs also work as part of the Middle School team consisting of Academic, Counseling and Student Living staff members. Residential Advisors (RAs) provide dormitory coverage and student supervision in order to also ensure the safety and well-being of our dorm students. The majority of our Student Living staff members are Native American and from students’ own home communities, providing them with a unique understanding of student cultural backgrounds. Further, Student Living provides ongoing professional development and skill-building through on-site college courses in partnership with Northern New Mexico College.